In spite of protests from animal rights activists, the controversial permit to hunt and kill a black rhino in Namibia sold for $350,000 at an auction in Dallas on Saturday. 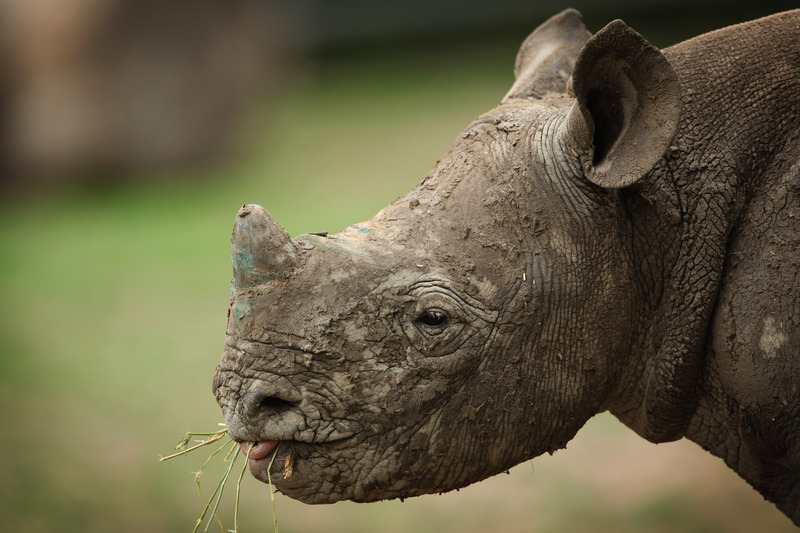 The auction, held by the Dallas Safari Club in Texas, was ostensibly meant to raise money in order to protect the highly endangered species — and even the hunt itself, the club argued, would help the dwindling rhino population. By, you know, killing one of the very few black rhinos in existence. The license, which sold for a cool $350,000 Saturday, permits the hunting and killing of one, old male, non-breeding rhino — which, according to Ben Carter, the Safari Club's executive director, would be a likely target for removal anyway, since it is growing increasingly aggressive and putting other wildlife at risk. "These bulls no longer contribute to the growth of the population and are in a lot of ways detrimental to the growth of the population because black rhinos are very aggressive and territorial. In many cases, they will kill younger, non-breeding bulls and have been known to kill calves and cows," Carter said earlier this week, perhaps before swiveling around to stroke a large, stuffed rhino head. The auction took place under tight security, with roughly 40 protestors gathering outside, chanting and holding signs. Over 75,000 people also signed an online petition at www.causes.com to stop the license being sold — the permit is one of five that Namibia offers per year, but the first that was purchasable outside of Namibia. "This auction is telling the world that an American will pay anything to kill their species," said the North American regional director of the Massachusetts-based IFAW, said this past week. "This is, in fact, making a spectacle of killing an endangered species." "But the truth is that non-hunting ecotourism, such as the photo safaris that Carter scoffs at, provide much greater revenue to Africa, which is a real incentive to keep rhino populations plentiful. Indeed, ecotourism has become such an important part of some African countries’ economies that governments are taking steps against hunting in order to protect this flourishing industry. For example, last year, Botswana announced a ban on hunting permits, citing its booming ecotourism sector, which now makes up 12% of national GDP, as the primary factor. Compare this to trophy hunting, which as a portion of any national economy never accounts for more than 0.27 percent of the GDP." Roughly 1,800 black rhinos live in Namibia, out of a total worldwide population of only 5,055. Back in the 1960s, that number was 70,000. Thanks to yesterday's auction, some guy will be gunning that number down even more.